They came to mingle, learn a thing or two, and see good maps. 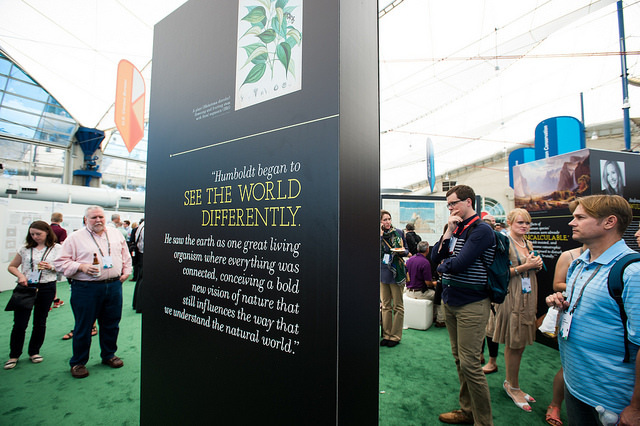 After the Esri User Conference plenary on Monday, attendees flocked to the San Diego Convention Center Sails Pavilion to witness the marriage of science and aesthetics at the Map Gallery Opening and Evening Reception. 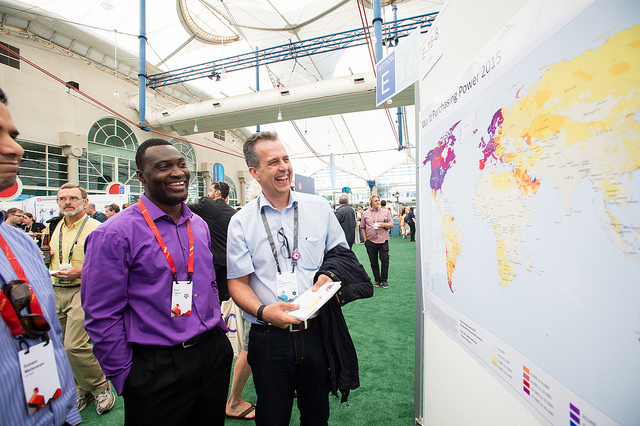 Geographers and GIS professionals strolled the gallery with drinks and finger food, examining hundreds of maps created by Esri users with ArcGIS. Some were made by seasoned professionals while others were the handiwork of university and high school students—a testament to the broad use of GIS in academia. All of the individual pieces added up to a stunning collection that resembled a fine art show. Entries from the younger map authors were on prominent display in the pavilion. Winners of the Esri Young Scholars Award showed why they were recognized for cartographic excellence; their maps told the stories of urban energy consumption in Italy, trajectories of accident patterns in Malaysia, and the need for GIS deployment in United Kingdom classrooms. The contributions of these budding cartographers were a melting pot of topics that truly spanned the globe. Other maps showed concentrations of water main leaks for utility asset maintenance; flight paths of raptors to improve endangered bird species conservation; parcel values in Maui, Hawaii; the influx of luxury car brands in Tokyo, Japan; traffic data from highways in Turkey; population growth in Louisiana; and the dispersal of Bay checkerspot butterflies throughout San Rafael, California. The point wasn’t lost on gallery visitors: name any topic, and a map can tell that subject’s story better than any other medium. The 90,000 square-foot exhibit space was not only the perfect venue for hundreds of large-format maps but also a meet and greet with UC keynote speaker and author Andrea Wulf. Signing copies of her critically acclaimed book The Invention of Nature: Alexander von Humboldt’s New World, Wulf shook attendees’ hands and expounded on her scientific expeditions. Whether you’re a UC attendee this year or plan to attend next year, consider submitting a map to next year’s Map Gallery. You might already have a map in the works that will earn its spot in the Show of Cartographic Shows. Explore photos of the Map Gallery Opening and Reception on Esri Flickr.